If you think the much-hyped Atlantic hurricane season has turned into a bit of a snoozefest, forecasters warn that it's not time to nap just yet. Yes, the season was forecast to be an active one, but so far, with the mid-September peak rapidly approaching, not a single hurricane has formed. The five named storms petered out uneventfully. However, forecasters believe the season will still turn out to be busy, and urge the millions of coastal residents not to get complacent. 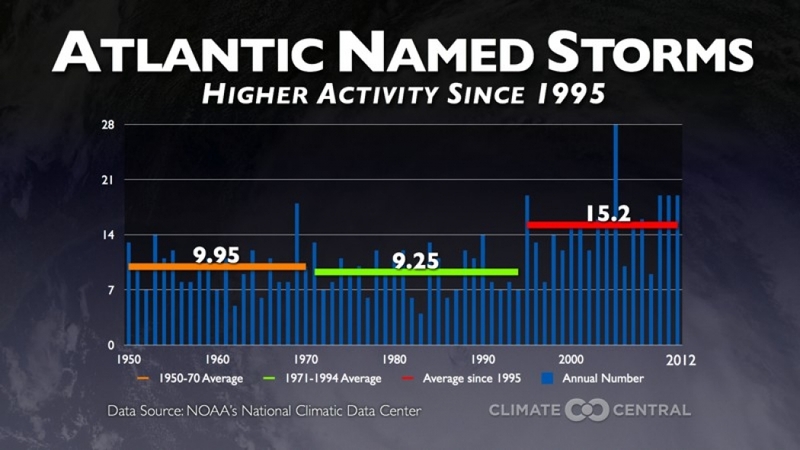 Since 1995, we've been in an active period of tropical cyclone activity, where the average number of named tropical storms has jumped significantly to 15.2 per year. Click image to enlarge. 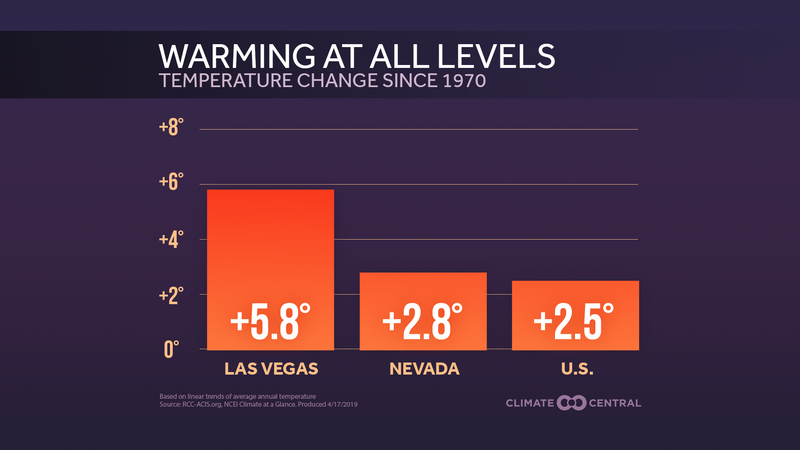 Credit: Climate Central. Major hurricanes cause the greatest damage, and the vast majority of them — 95 percent — take place during the three-month period of August, September, and October. Half of all major hurricanes have historically taken place during September alone, suggesting that a quiet August provides no guarantees for a quiet season overall. Also looming is that the U.S. is overdue for a major hurricane strike, as the country has gone nearly eight straight years without one. The last such storm, Hurricane Wilma, crossed Florida in 2005. The U.S. has seen its fair share of deadly and expensive hurricanes during that period, though. Hurricane Sandy, for example, was the second-most expensive hurricane on record (although it was not technically a hurricane at landfall). Florida officials are reminding residents of the most hurricane-prone state that despite the quiet August, the tropics can spawn trouble at anytime between now and the end of hurricane season in November. 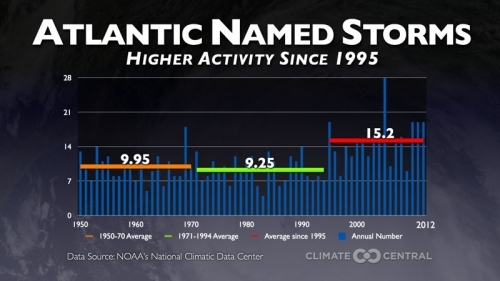 While storm activity varies from week-to-week during hurricane season, the Atlantic has generally been in an active phase of hurricane activity since 1995, which has been at least partly attributed to natural climate variability. The conditions now in place include above-average Atlantic sea surface temperatures, and a stronger rainy season in West Africa, which can help initiate groups of thunderstorms that go on to become tropical storms and hurricanes in the Atlantic. Coastal residents and insurance companies that are still trying to recover from last year’s season, in which Hurricane Isaac swept into Louisiana, and Hurricane Sandy paralyzed the Mid-Atlantic states, have a few specific factors to thank for the current lack of activity. For much of the season so far, the Atlantic Basin has been dominated by dry, sinking air, which promotes clear skies and makes it difficult for areas of thunderstorms to percolate and organize into tropical depressions, and eventually, hurricanes. Nascent storms have also been choked by specks of dust blown off the scorching Sahara Desert, which also tends to lead to sinking, dry air, rather than the moist, unstable environment that hurricanes need in order to thrive. Some of the dust from the Saharan Air Layer has hitched a ride on trade winds to make it as far west as Texas, where it has contributed to hazy conditions at times this summer. 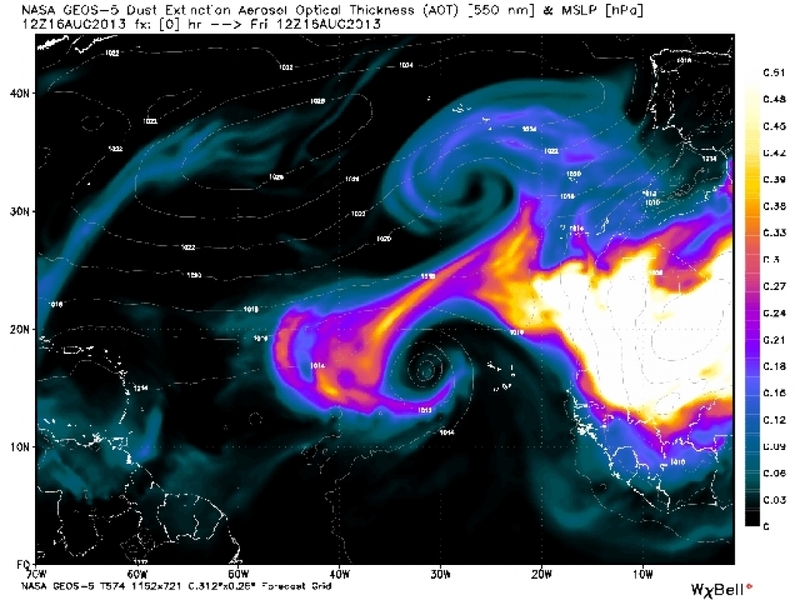 A computer model image shows the extent of dry air flowing westward from Africa on August 16. Click image to enlarge. Credit: WeatherBELL Analytics. Another factor that has helped squelch storms is a natural cycle of rising and sinking air that circulates around the tropics, known as the Madden-Julian Oscillation, or MJO. When the MJO is in particular phases it can promote the formation of thunderstorms in the tropical Atlantic, and so far, the MJO has been favoring drier conditions. 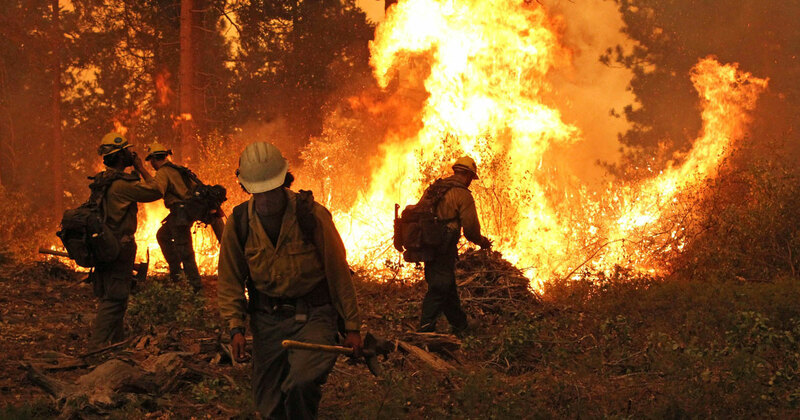 Ryan Maue, a meteorologist with the private forecasting firm WeatherBELL Analytics, said the past 10 days have been particularly quiet, but the lull may not last much longer. “Forecasters will be watching easterly waves over the African continent as they emerge off the coast during next week or two,” he said, as the MJO shifts into a more favorable phase for Atlantic hurricane activity. 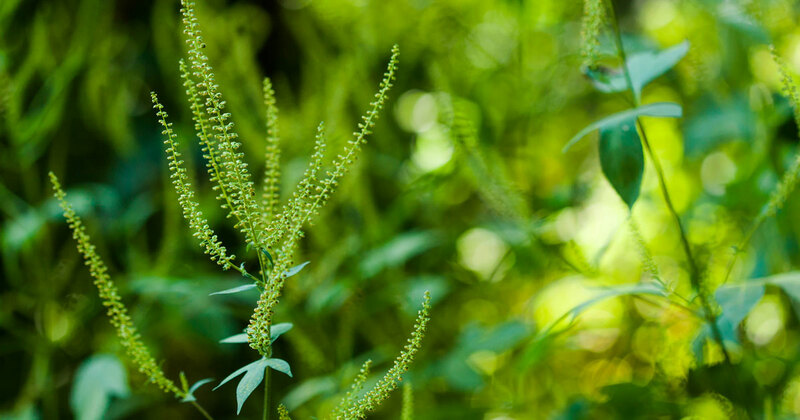 In addition to the 2001 season, Landsea also cited 1988 as a late-blooming season that turned out to be very destructive. That season brought Category 5 Hurricane Gilbert, which caused extensive destruction in the Caribbean and Mexico, killing 318 and setting a record for the lowest atmospheric pressure ever recorded in the Western Hemisphere. “We do realize that in some years the forecast doesn’t work out,” he said.